A scientist from the University of Utah has confirmed that two continent-sized "thermochemical piles" are slowly converging at the bottom of Earth's mantle about 1,800 miles (2,900 km) beneath the Pacific Ocean. This process, says geologist Michael Thorne, could eventually lead to a cataclysmic eruption that could "cause very massive destruction on Earth." But don't panic quite yet. His research suggests that this super-volcano-in-the-making may not erupt for another 100 to 200 million years. The new study, which is set for publication in this month's issue of Earth and Planetary Science Letters, suggests that the collision of the two piles is creating a massive reservoir of partly molten rock that could eventually lead to one of two different kinds of super-eruptions in the far future. The first scenario is a "hotspot plume," the kind of large scale geological event that happened about 2 million years ago at Wyoming's Yellowstone caldera — an eruption that covered North America in blanket of volcanic ash. The second possibility is a flood basalt eruption — a more protracted event similar to what happened in India's Deccan Traps about 65 million years ago. In this scenario, a large and volatile volcanic region spews lava to the surface over an extended period of time — continuous eruptions that can last thousands of years, resulting in large igneous provinces. A similar thing happened in the Pacific Northwest's Columbia River region about 17 million years ago. 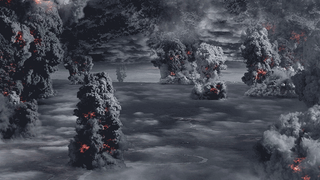 Needless to say, these eruptions are extremely disruptive to ecosystems, and may be tied to some extinction events; ash and volcanic gases make life difficult for organisms (including massive die-offs in the oceans caused by oxygen loss). And now, Thorne says a similar thing could happen again, but this time in the South Pacific near the Samoan region. He reached this conclusion after investigating two massive piles that were discovered in the 1990s. Initially, geologists assumed that these continent-sized regions were static. But Thorne's high-resolution seismic images showed they are in fact colliding — and that they're gradually creating a "spongy blob" of partly molten rock that's growing to the size of Florida. The two piles, which rest on the boundary between the core and the mantle, are located underneath the Pacific Ocean and under Africa (we're talking really deep under Africa). Each of them are approximately 3,000 miles (4,830 km) across. "We call it a blob of partially molten material," said Thorne when speaking to NPR. "I mean it's big...this one that we found is an order of magnitude, maybe 10 times larger, than any of the ones we've observed before." The effect is like two rock piles that are being squished together, "squeezing this huge molten blob at the middle of it like some kind of balloon, and it is going on right underneath us." And indeed, Thorne's subsequent computer simulations helped him determine the shape and size of the two piles, while also demonstrating the theoretical potential for the region to trigger a massive plume eruption. It's by no means guaranteed, but if it were to happen, it would take place no earlier than 100 million years from now. As for Thorne's confirmation of plate activity, he used data extracted from over 50 earthquakes which occurred deep below the Earth's surface, and by analyzing changes in wave patterns in the rock where the core meets the mantle. The study was conducted along with Allen McNamara and Edward Garnero of Arizona State University, and Gunnar Jahnke and Heiner Igel of the University of Munich. The National Science Foundation funded the research. The study can be read at Earth and Planetary Science Letters. Supplementary sources: University of Utah and NPR. Top image via. Interior images: National Science Foundation, University of Utah.